I normally don’t rant on the blog but as you can see from the title of this post a nerve has been hit. We are in the season of giving…Christmas time and a lot of people are participating in Secret Santa exchanges. I know of two gatherings for sure…and both were a fail!!! I didn’t participate in either of them, but I still have an opinion. My office Secret Santa Exchange. I was on vacation when the idea came up for my unit to do Secret Santa as to why I didn’t participate (Thank goodness!). The email was sent to everyone and most participated. In the email was: the date the gifts would be exchanged and the amount agreed upon to spend on your person. Now the original email was sent on December 8 and the exchange of gifts was on Dec 18. So, here is where I am irritated….there were 10 whole days for everyone to get their person a gift(s) and something of quality for $20 (or more if one decided too) since all agreed this price was sufficient. Well wouldn’t you know…one person who participated did not receive her gift. Her secret santa told her that he and his wife would order her gift (charms for her badge holder), but because they hadn’t yet, he will settle on getting her a hand mirror (this was one of her gift ideas on her list). Now why would you tell your person that and still come empty handed? So, now- to date- she is still without a gift. The second person in my unit received her gift, but she didn’t know who her Secret Santa was because the person did not put their name on the gift bag, but oh don’t we know why now. A pretty gift bag with pretty tissue paper was handed to my co-worker, she was excited because she is a DIY’er (Do it yourself) and on her list, she asked for a tool set and gift cards to her favorite places. Well let me tell you what was in her gift bag….no, better yet let me show you. WTW(What the What)!!! Yes, this is what was in the bag! 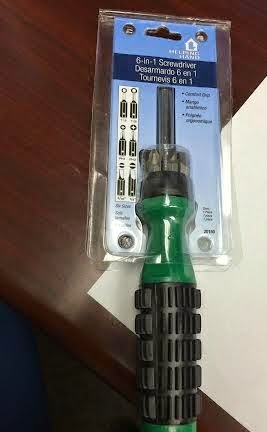 This is not a tool set. Now let me say, I don’t look a gift horse in the mouth and I am VERY appreciative for anything I receive, but this right here is awful. This right here shows no thought process in the gift giving and it was nowhere near amount suggested. I mean really...this was not even $5.00. Maybe this is why the culprit didn't put her name on the gift bag. I’m still baffled by this. My Facebook Group Secret Santa Exchange. I am in a Facebook Group with some personal friends of mine and they also did a Secret Santa exchange on Saturday, and wouldn't you know I woke up to notifications of some of them ranting about some people not receiving their gifts and leaving the gathering empty handed. Again, all knew that this day was coming and some still failed at presenting a gift. -If you know you won’t be able to participate like you want to, don’t sign-up for Secret Santa. Please! -If you sign-up….BRING YOUR GIFT and not an EXCUSE! I’m wondering how these people slept at night knowing they were not about the right thing! That is a hot mess and I would be pissed if I'd received it. I cannot believe someone would give this as a gift. As you mentioned, people who participate in secret Santa exchanges should join willing and ready to spend some money (not go broke or anything like that) and buy a gift that a person would really appreciate. I don't mean to laugh at your peeps but Hahahaha!!! That's hilarious!